What's New for the 2018 Subaru Impreza? The 2018 Subaru Impreza Premium, Sport and Limited get full redesigns compared to the 2017 model. Powered by a reworked 2.0-liter, flat-four rated engine, with 80 percent of the parts being new, including a direct-injection system that allows the engine to operate more efficiently. With 152 horsepower and 145 pounds per foot of torque, the Impreza makes the sprint from 0 to 60 mph in about 9 seconds. 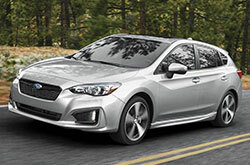 The Subaru Impreza amazes with its five-speed manual transmission, which is a standard on the base and Sport models, and CVT, Continuously Variable Transmission, is optional. Don't fret because Premium and Limited trims come only with the CVT. 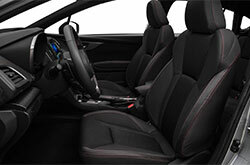 The trunk space on the sedan is 12.3 cubic inches and can be expanded by the standard 6/40 split-folding rear seats. The hatchback version offers 20.8 cubic feet behind the split-folding rear seats and 55.3 cubic feet behind the front seats giving you more space for all of your needs. Where the manual Subaru Impreza is concerned, the sedan is rated at 24/32 miles per gallon, city/highway, while the hatchback is rated at 24/31 miles per gallon. If you opt for the CVT the EPA fuel economy ratings jump to 28/38 miles per gallon for the sedan, and 28/37 miles per gallon for the hatchback. The Sport trim is the least efficient with manual models rated at 22/31 miles per gallon for the sedan and 23/30 miles per gallon for the hatchback. CVT-equipped Sport models are rated at 27/36 miles per gallon for the sedan and 27/35 miles per gallon for the hatchback. The Impreza comes stock with standard 16-inch steel wheels, Bluetooth connectivity, cloth upholstery, Starlink infotainment system with a 6.5-inch touchscreen, Android Auto and Apple CarPlay integration, a USB port and a rearview camera. 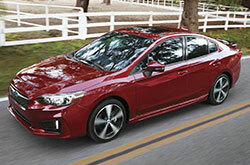 The base Impreza comes standard with 16-inch steel wheels, cloth upholstery, Bluetooth connectivity, Starlink infotainment system with a 6.5-inch touchscreen, a USB port, Android Auto and Apple CarPlay integration, and a rearview camera. Higher trims offer automatic climate control, keyless entry/start, leather upholstery, a Harman Kardon premium audio system, fog lights, adaptive full LED headlights, alloy wheels ranging from 16 to 18 inches in diameter and heated front seats and navigation. The Sport version features a sport-tuned suspension with Active Torque Vectoring. Powered by a reworked 2.0-liter, flat-four rated engine, with 80 percent of the parts being new, including a direct-injection system that allows the engine to operate more efficiently. 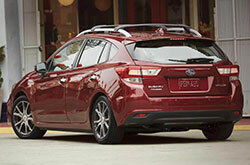 With 152 horsepower and 145 pounds per foot of torque, the Impreza makes the sprint from 0 to 60 mph in about 9 seconds. The Subaru Impreza amazes with its five-speed manual transmission, which is a standard on the base and Sport models, and CVT, Continuously Variable Transmission, is optional. Don't fret because Premium and Limited trims come only with the CVT. 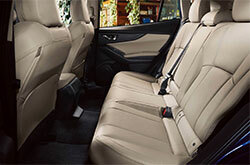 The trunk space on the sedan is 12.3 cubic inches and can be expanded by the standard 6/40 split-folding rear seats. The hatchback version offers 20.8 cubic feet behind the split-folding rear seats and 55.3 cubic feet behind the front seats giving you more space for all of your needs. The 2018 Impreza received a five-star rating on the side impact and rollover test from the NHTSA, out of a possible five stars. The IIHS hasn't crash tested a 2018 Impreza yet but the 2017 model received a Good score, with Good being the highest possible score, on all crashworthiness tests and the new headlights test. In the front collision prevention test, the Impreza received a Superior rating, with Superior being the highest possible rating, after it avoided collisions in 12- and 25-mph tests. As a result, the IIHS awarded the Impreza the 2017 Top Safety Pick+ award. Subaru's EyeSight Suite bundles forward collision warning, automatic emergency braking, adaptive cruise control, Blind spot warning with rear cross-traffic alert are bundled together with EyeSight and automatic high beams or fog lights that turn into corners. The EyeSight Suits is available on all but the base trim of the 2018 Impresa making the Impreza one of the safest compact cars you can buy. 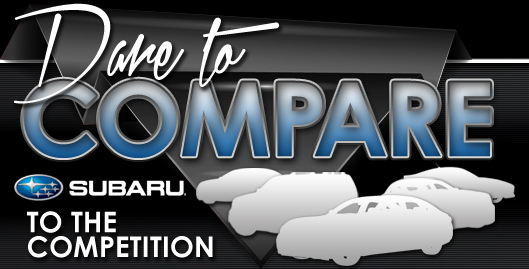 Subaru is the 2018 Top Brand for Residual Value, according to ALG with more Kelley Blue Book Awards than any other brand.